BISE Abbottabad Board Result 2019 Online Search by Roll Number. BISE Abbottabad (BISEATD) biseatd.edu.pk annual exam results 2019 will be announced here at the official website, the date of biseatd result 2019 has been given below. Top 20 Position Holders: will be published on 16 June 2019. 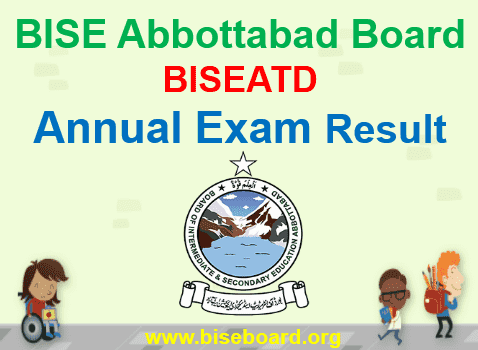 BISE Abbottabad Board Guzzet 10th class Result 2019: will be published on 17 June 2019. Result via SMS is an innovative service through which students can get their required educational board or university result through a single SMS from any mobile network. The student will educational board code with roll number to 9818 to get their result the services available for the following boards/institutions. eDMC (Electronic Detailed Marks Certificate) as a specialized service that enables the student to get their result for each subject.eDMC is the electronic format of DMC (Detailed Marks Certificate) for information purpose only. Students will have to visit authorized outlets (Franchise) to get eDMC Click Here to find the nearest Franchise in your area. This service is available for the following Boards. Government schools, including Higher Secondary Schools and colleges, Tehsil-wise, both male and female. Private Schools, male and female, Tehsil-wise. Private Colleges, male and female, Tehsil-wise. Summary of institutions affiliated with the Board. All students of 9th and 11th class are required to be registered with the Board. The student population here is that of registered students. In our Board area, however, a very large private student population is also there, whose examination requirements are also met by the Board. Five districts, namely Haripur, Abbottabad, Mansehra, Battagram and Kohistan. This encompasses an area of 17,194 square kilometers and a population of 3.47 million.